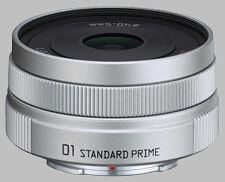 (From Pentax lens literature) The PENTAX 01 Standard Prime lens for Q-series cameras ships standard with the PENTAX Q. It is an outstanding unifocal lens for everyday use, sporting a magnification similar to that of the human eye. Lens shutter features 5 aperture blades and syncs with the Q's built in flash at speeds up to 1/2000 sec. The Pentax Q 8.5mm f/1.9 01 Standard Prime doesn't have any user reviews yet!